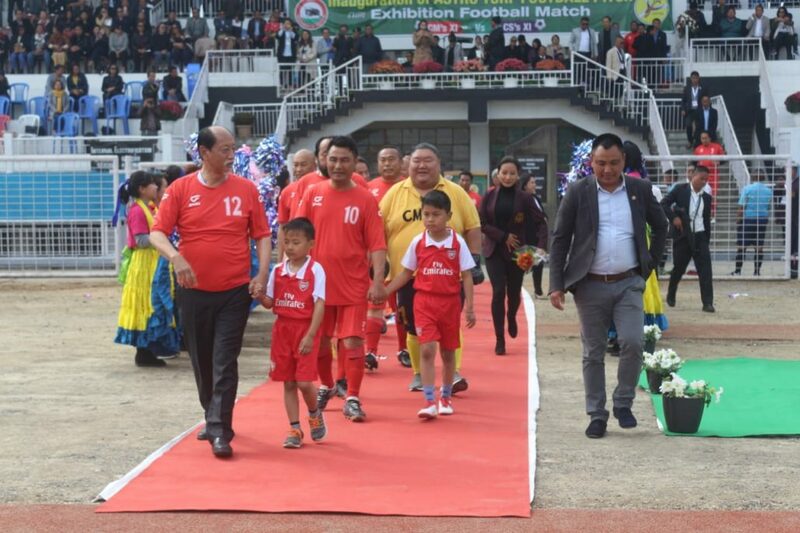 Commemorating the 101st birth anniversary of Dr T. Ao, Nagaland chief minister Neiphiu Rio inaugurated the first Astro-turf football ground in the state at Indira Gandhi Stadium in Kohima on Monday. Dr T. Ao, was the first captain of Independent India’s Olympic football team at the 1948 London Olympics. Addressing the inaugural programme, Rio said the state government is working on strategic sports infrastructure development plan to provide every district in the state with quality sports facilities. “We are engaging proven sports consultants for an infrastructure development plan,” he said. To begin with, Rio said, the state government is partnering with the Bhaichung Bhutia Football Schools for a game development plan with young footballers. “Under-16 footballers from all over the state will get the opportunity to be part of the programme which will include exposure events and junior leagues,” he said. Rio also said his government has taken concrete steps to bring back development of sports and games on track again. He listed the steps taken by the government which included laying of foundation stone of Dr T. Ao Regional Football Academy, restoration of T. Ao State Sports awards and Dr. T. Ao Football Trophy, and introduction of Dr. T. Ao Memorial Lecture, which will become an annual event. At the Dr. T. Ao Memorial Lecture in the evening, Padma Shri and former Indian football team captain Bhaichung Bhutia was the guest speaker. Congratulating the state youth resources and sports department for completing the Astro-turf project in record time and in an exemplary manner, the chief minister said the foundation for achieving excellence in sports and games at the national and global levels is good infrastructure. “We cannot expect our sportspersons to return with medals and accolades without providing them good infrastructure,” he said. He hoped that with the installation of this first Astro-turf, Nagaland will begin the process of development of football. Rio appealed to all sportspersons of the state to rededicate themselves towards reaching the highest standards. Assuring to do everything possible to support and promote sports and games in the state, he urged the sports associations and federations to play a more proactive role to collectively work together as a team for the good and the future of our sportspersons. Coinciding with the celebration of Dr Ao’s birth anniversary, the 20th Inter District Football Tournament, under the aegis of Nagaland’s youth resources and sports department and Nagaland Football Association, kicked off at Indira Gandhi Stadium on Monday. The tournament has been named after Dr. T. Ao. An exhibition match between Chief Minister’s XI and Chief Secretary’s XI was played after the inaugural event.